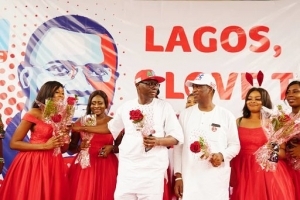 Lagos was painted red with love yesterday, as friends of the governorship candidate of the All Progressives Congress (APC) in Lagos State, Babajide Olusola Sanwo-Olu organized a Valentine’s Day event with Lagosians, with the aim of spreading love, themed: ‘A Passion to serve’. The events, took place at Abule Egba, Festac, Ikeja, Surulere, and Tafawa Balewa Square (TBS), Lagos, and featured music, dance competition, pretty ladies in red, addressed as ‘Sanwo Angels’, handing out roses to Lagosians, and dance dramas that passed the ‘T.H.E.M.E’ message of Sanwo-Olu to Lagosians. Sanwo-Olu in company with his running mate, Dr. Obafemi Hamzat surprisingly stopped by at the Ikeja venue, to a rousing welcome from supporters. Sanwo-Olu personally handed out roses to Lagosians, and also reiterated his plans for a greater Lagos. He said: “From the creative energies of our youths, the spirit of enterprise in our land, to the wisdom of our elders, I am persuaded a greater Lagos is possible. 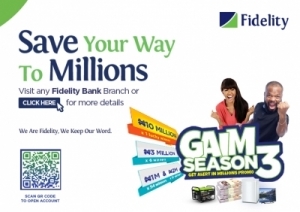 There could not have been a better day for me to tell you of my love to serve you than today,” he said. Speaking further, Sanwo-Olu said that his administration will be committed to reducing travel time and increasing per capita productivity for Lagosians by improving infrastructures such as road, rail and water transportation. “Our major healthcare plan is to improve access and affordability through comprehensive health insurance and improve primary and secondary health facilities. And for our environment, LAWMA’s waste management system will be upgraded for better service delivery while we implement measures to turn waste to wealth and ensure a clean and healthy environment in Lagos,” he added.